Rocker at Squaw located in The Village at Squaw Valley, in Olympic Valley, California was the perfect break after a well-spent morning skiing with Olympic Gold Medalist Jonny Moseley at Squaw Valley. After our morning workout skiing at Squaw Valley in late February 2012, home of the 1960 Winter Olympics, we had worked up a very hearty appetite. Rocker@Squaw, a hip restaurant/bar that opened in December 2011, was the perfect place to take a break, sit back and relax, loosen up our ski boots, warm up, and enjoy a delicious lunch before Edward and I ventured out on the slopes again for an afternoon of skiing. Located in The Village at Squaw Valley, and nestled among interesting boutiques, restaurants, the Red Dog lift, and the Funitel, we simply skied up to the restaurant, left our skis and poles at one of the ski racks, and proceeded inside. The ambience at Rocker@Squaw is casual and comfortable, you can eat at one of the wood tables and chairs or take a seat at the large bar where they have a nice selection of draft and bottled beers as well as an interesting cocktail menu of cold and hot drinks, or perhaps download your video and see it on their big screen at the video bar, and the service is fast, friendly, and professional. 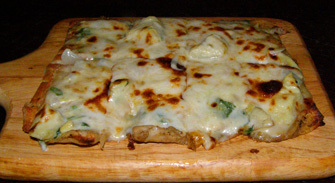 With a diverse menu to explore, and hungry, growling stomachs seeking comfort, Edward and I began with Rocker's Spinach Artichoke Flatbread with Jack and Parmesan Cheese, which was loaded with spinach and artichokes, bubbly with the melted cheeses, and very tasty. 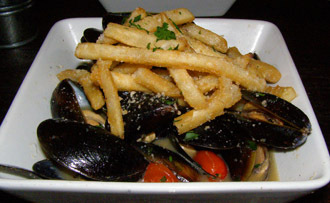 We followed the flatbread with Steamed Mussels that were served in a rich broth made with Newcastle Ale and topped with crispy, garlicky French fries, which was definitely a winning combination. Edward worked on the ample portion of mussels while I concentrated on the crispy fries, although he did manage to eat a few the fries when I was not looking. 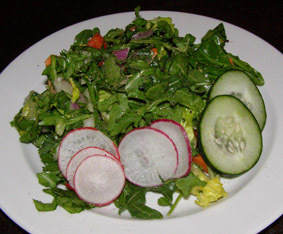 Next, there was their Raw Chop Chop salad, made with finely chopped carrots, cucumbers, sweet onions, celery, peppers, romaine, radicchio, and radish, that was dressed with a tasty herb honey vinaigrette. 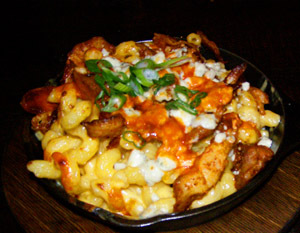 For his entrée, Edward had the Buffalo Chicken Mac and Cheese, which was classic macaroni and cheese topped with smoked Buffalo chicken, blue cheese, and scallions, that was comfort food at its best, served in a small black cast iron skillet. 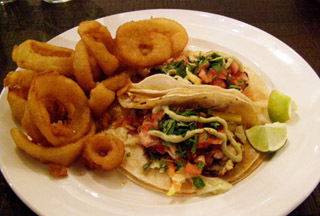 I had the Grilled Fish Tacos made with halibut, and laden with avocado cream, salsa, and vegetable slaw, and served with giant, golden, and delectable beer battered onion rings, which Edward also sampled. Completely satisfied, we left the restaurant, jumped on the Red Dog Lift, and spent the afternoon skiing and working off our delectable lunch at Rocker at Squaw. Rocker@Squaw is located in The Village at Squaw Valley opposite the Red Dog Lift, is accessible by car, ski lift, or the Resort at Squaw Creek Shuttle, and is open Sunday through Thursday from 11:00 am until 9:00 pm for food, Friday and Saturday from 11:00 am until 10:00 pm for food, and the bar is open later depending on the crowd.